Banana and plantain (Musa spp.) are the most important fruit crops of India; the largest banana producer on the globe. 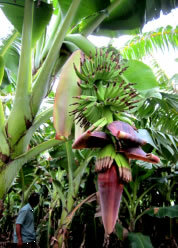 The major problem however faced in the banana growing areas is the shortage of uniform and disease-free planting materials, which is due to the vegetative mode of propagation of the plant (through side-suckers) at a slow pace in conventional cultivation. This difficulty can be addressed by employing the commercial tissue culture technology for mass-production of the popular banana varieties. The said tissue culture technology can also be utilized for conservation & multiplication (as per the requirement) of other locally important, elite, endangered and ornamental banana varieties. Initiation of aseptic cultures from shoot-tips obtained from disease-free banana plants. Induction of roots to individual shoots. Primary & secondary hardening of the tender plantlets in the poly-house. Field-transfer of the hardened tissue culture plants. The ‘banana tissue culture propagation’ is now an established and popular technology due to the advantages it offers such as : large-scale production of disease-free planting materials, comparatively uniform plant-stand in the field, early harvesting of superior fruit bunches, round the year availability of the planting materials etc. 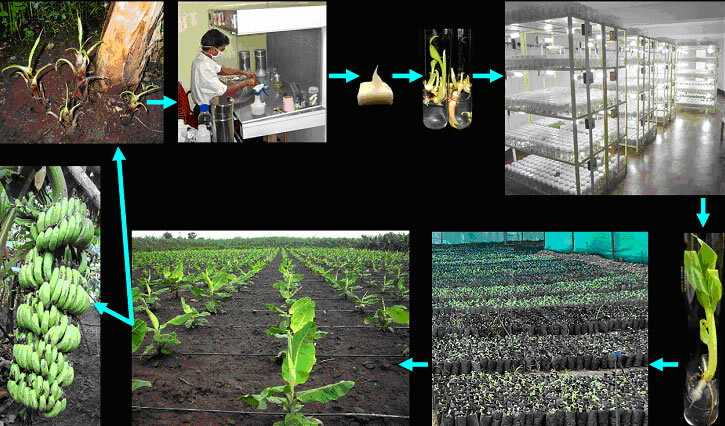 BARC has developed and transferred the banana tissue culture know-how for large and` small scale commercial production to the users in semi-urban and rural India; including the small scale tissue culture laboratory established for AKRUTI-CARD at Anjangaon-Surji, district Amravati, Maharashtra. The spread and popularization of “BARC’s Banana Tissue Culture Know-how” at grass-root level opens up new avenues for sustainable developments in rural India. Infrastructure : A tissue culture laboratory, a poly-house facility for weaning tissue culture plantlets. Equipments : Standard glassware, tissue culture racks, clean-air bench, autoclave, pH meter, weighing balances, surgical-ware etc. Chemicals : All the ingredients of Murashige & Skoog’s basal medium, sucrose, growth hormones, gelling agents etc. Manpower : Skilled technician/s (trained in a tissue culture laboratory) for laboratory work and supporting staff & workers.